This incisive article was written prior to the latest timely terrorist attack in Ankara, which resulted in 28 dead and 61 wounded. President Erdogan has vowed to retaliate. Turkey has been hit by a series of attacks in recent months, and there have been increasing concerns that the country could be targeted by another big attack. It is not clear who was behind the blast in Ankara. Security sources blamed both so-called Islamic State (IS) and militants from the banned Kurdistan Workers Party (PKK), Reuters reported. Is the right of self defense being used to justify military intervention in Syria? Terror attacks have repeatedly rocked Turkey over the last year. The government has blamed ISIS and Kurds for the attacks … and is about to use this “justification” to launch troops into Syria. But there is an alternative explanation. Specifically, government officials have admitted that Turkey has repeatedly carried out false flag attacks. (1) The Turkish Prime Minister admitted that the Turkish government carried out the 1955 bombing on a Turkish consulate in Greece – also damaging the nearby birthplace of the founder of modern Turkey – and blamed it on Greece, for the purpose of inciting and justifying anti-Greek violence. (2) The former Italian Prime Minister, an Italian judge, and the former head of Italian counterintelligence admit that NATO, with the help of the Pentagon and CIA, carried out terror bombings in Italy and other European countries in the 1950s and blamed the communists, in order to rally people’s support for their governments in Europe in their fight against communism. As one participant in this formerly-secret program stated: “You had to attack civilians, people, women, children, innocent people, unknown people far removed from any political game. The reason was quite simple. They were supposed to force these people, the Italian public, to turn to the state to ask for greater security” (and see this) (Italy and other European countries subject to the terror campaign had joined NATO before the bombings occurred). And watch this BBC special. (3) A top Turkish general admitted that Turkish forces burned down a mosque on Cyprus in the 1970s and blamed it on their enemy. He explained: “In Special War, certain acts of sabotage are staged and blamed on the enemy to increase public resistance. We did this on Cyprus; we even burnt down a mosque.” In response to the surprised correspondent’s incredulous look the general said, “I am giving an example”. (4) High-level American sources admitted that the Turkish government – a fellow NATO country – carried out the chemical weapons attacks blamed on the Syrian government; and high-ranking Turkish government admitted on tape plans to carry out attacks and blame it on the Syrian government. Sarin was sent to Syria from Turkey via several businessmen. Pulitzer-prize winning investigative reporter Seymour Hersh – who uncovered the Iraq prison torture scandal and the Mai Lai massacre in Vietnam – previously reported that high-level American sources tell him that the Turkish government carried out the chemical weapons attacks blamed on the Syrian government. We knew there were some in the Turkish government,’ a former senior US intelligence official, who has access to current intelligence, told me, ‘who believed they could get Assad’s nuts in a vice by dabbling with a sarin attack inside Syria – and forcing Obama to make good on his red line threat. 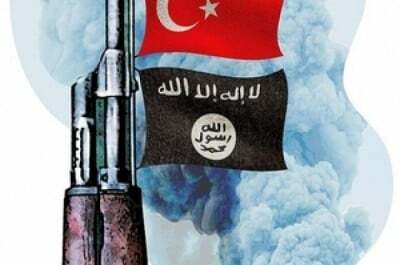 (5) While Turkey pretends it’s fighting ISIS, Turkey is actually one of the main supporters of ISIS.